Red is one of the rarest colors in the gems world, and fine red gems are always in demand. In our recent newsletters we looked at Rubellite Tourmaline and Rhodolite Garnet. This month we turn our attention to Ruby, famed as the Queen of Colored Gems. The purest reds in the gem world are the rubies from an area in Burma known as the Mogok Stone Tract, about 200 km north of Mandalay. This region has been famous for centuries for fine pigeon blood ruby with a distinctive fluorescence. A more recent deposit in Mong Hsu in Burma has also yielded quantities of ruby, but these gems required heat treatment to achieve a true red color. While fine Burma rubies continue to be the most valuable in the world, ruby production from Burma has declined significantly in recent years and most of the larger rubies entering the market are now from other sources, particularly Tanzania, Mozambique and Madagascar. Mozambique has become particularly important since 2009 when high quality rubies, including some star rubies, were found in Montepuez in the northern part of the country. Gemfield Plc acquired mining rights in 2011 and launched a major mining project with modern equipment. 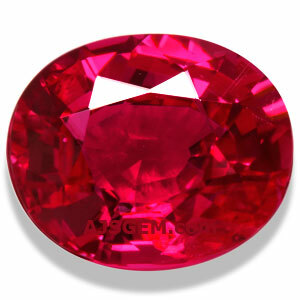 Gemfields now offers twice yearly auctions of rough Mozambique ruby in Singapore. The finest Mozambique rubies can come close in color to high quality Burmese rubies, but they do not have the same distinctive fluorescence of the Burmese. The reason is that Burmese rubies are very low in iron, while the Mozambique rubies have a somewhat higher iron content. What makes the Mozambique rubies quite special in the gem market is that the mines are producing some larger gems that don't require heat treatment. The market has seen a significant supply of Mozambique rubies with a vivid red color over 2 carats, with a number of high quality gems between 5 and 10 carats. By comparison, recent production of Burmese rubies has been almost exclusively in smaller sizes, with the vast majority of gems requiring heat treatment. Thought the African ruby doesn't rival the finest Burmese material, there are some very fine African gems, and they are highly valued in the gems market. Ruby continues to be one of the rarest of all colored gems, and the supply of clean stones of excellent color is always way below market demand. Fine rubies are highly prized by collectors and they have proven to be one of the best of all investment gems. This month we feature fine Rubies from our collection, including some special jewelry pieces that we've designed for some of our best Rubies. Click on any photo to view the details for the gem. A big and beautiful top quality, pigeon's blood red Burmese Ruby with top color and intense saturation. The stone is quite clean and brilliantly fashioned, truly a unique treasure. A certificate from GemResearch Swisslab (GRS) stating the color as "vivid red" "pigeon's blood" is included with the purchase of this fine gemstone. A vivid pigeon's blood red Burma Ruby over 3 carats set in an elegant ring with diamonds. This is a fantastic Burmese Ruby with top color and intense saturation. The stone is quite clean and beautifully cut, This magnificent gem has been cut into a fine trillion shape, a lovely and unusual design for a Ruby this large. Certified as "pigeon's blood red" by GemResearch Swisslab (GRS). This rare Ruby has been set in an unique 18k white gold ring with 32 fine white diamonds with a total weight of 0.38 cts. This is an outstanding piece of jewelry for the rare gem collector, designed by AJS Gems and fabricated to the highest standards. A passionate Burma Ruby heart set in an elegant 18k white gold pendant with diamonds. The 2.03 ct Burma Ruby is an exceptional stone with a fully saturated ruby red color. Certified as vivid red "pigeon's blood red" by GemResearch Swisslab (GRS). The pendant features 33 fine white diamonds with a total weight of 0.28 cts. Designed by AJS Gems, this is an exquisite piece of jewelry that will make a very special gift. A really top Unheated Mozambique Ruby well over 2 carats! Terrific pigeon blood color, very clean. Certified as natural and unheated by GemResearch Swisslab (GRS), with the color graded as "vivid red (GRS type 'pigeon's blood')." An excellent example of the fine Ruby coming from Mozambique. A very rare and special 5 carat unheated Star Ruby from Burma, set in a custom 18k white gold ring with diamonds! The color is a top pigeon blood red, with wonderful translucency. This unusual gem displays a well-defined 6-ray star under a focused light. This fine gem has been certified by GemResearch Swisslab (GRS) as natural Star Ruby, origin Burma, with no thermal enhancement detected. GRS has graded the color as "vivid red (GRS type 'pigeon's blood')". A top pigeon blood Ruby from Madagascar! Completely untreated and exceptionally clean with wonderful brilliance and luster. Well cut with nice proportions, this fine Ruby will set up beautifully in your jewelry design. Certified by Gemological Institute of America (GIA) as natural Ruby with no indication of heating, origin Madagascar. 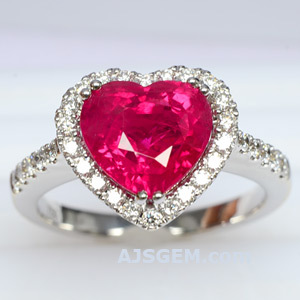 Take advantage of bargain prices on high quality natural gems from the AJS collection! We have single stones, lots and carvings in a huge variety of colors and sizes. A great way to get started with collecting and jewelry-making! The current auction record for a faceted Ruby is held by the 25.59 ct Sunrise Ruby, a Burma Ruby set in a Cartier ring that sold for $32.42 million at Sotheby's Geneva auction in May 2015. 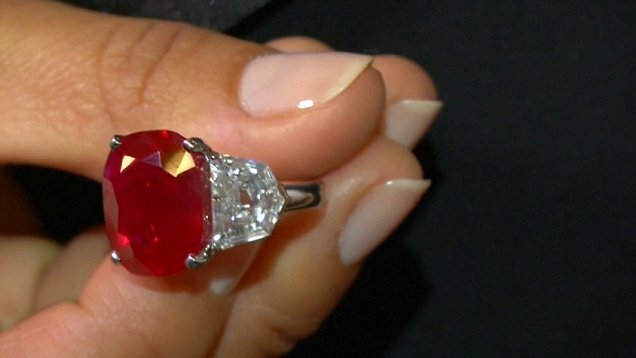 At $1.26 million per carat, it also holds the record for the most expensive colored gemstone in the world. The most valuable Star Ruby is a 19.53 ct Burma gem, sold at Christie's Hong Kong auction in November 2012 for $1.24 million ($63,871 per carat). The record for Mozambique Ruby goes to a matched pair (14.54 and 13.12 carats) of faceted Ruby earrings, sold at Tiancheng in Hong Kong in December 2017 for $6.15 million ($222,481 per carat). Though the USA is not one of the major sources for colored gems, there are some world class gems mined there, and we have a number of examples in our collection. Two exceptionally rare gems are found only in the USA -- Red Beryl from Utah and Benitoite from California. They are both among the rarest varieties in the world. The finest Sunstone is mined in Oregon, while the translucent Gem Silica from the Inspiration Mine in Arizona is regarded as the best anywhere. The Rhodochrosite from the Sweet Home Mine in Colorado is also world class. Other gems found in the USA include Williamsite from Maryland, Peridot and Amethyst from Arizona, sapphire from Montana, Ruby from Wyoming and Goshenite Beryl from various locations.